I know so many of my blog followers can’t resist a cute novelty print and you all know by now I can’t either so I wanted to share the most adorable kitty cat boarder print I was lucky to get my hands on from Dangerfield Clothing. You might remember Dangerfield Clothing from an early post I did that featured the cutest Poodle boarder print skirt. Dangerfield Clothing is an Australian clothing company and has a fabulous retro/vintage line ‘Revival’. 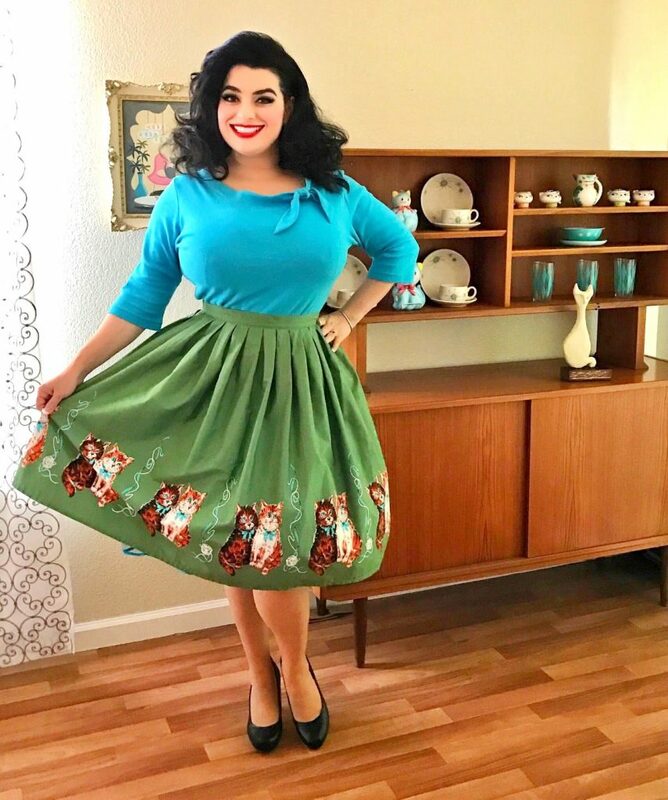 They have brilliant vintage style 1950s novelty prints so if you love novelty prints you’ll want to keep an eye on this brand. Shipping from Australia to USA has been around 1 week so fast shipping they do; for reference I am in California and within a week have my items. The skirt I am featuring today is Dangerfield’s ‘Pawsitive’ dress. Yes, it started out as a dress!! It was a sleeveless, fit and flare dress with a pleated skirt made of cotton- pictured here. I ordered my standard Australian size of 18 to fit my voluptuous upper half but when it arrived it was a no-go. I wasn’t surprised…. a bit saddened but not surprised. I find their tops, cardigans and dresses run incredibly small and most do not have any stretch so it was no surprise the top half of the dress would not fit over my curvaceous upper half. This was my first dress I had converted into a skirt. Since the main reason I purchased the dress was because of the kitty cat boarder print, a skirt would be perfect. I took it to a seamstress and what an easy fix, problem solved, I now had the most fabulous skirt!! Turquoise is my favorite color and the skirt features balls of yarn and the bows on the kitties in the color turquoise so I paired the skirt with my Heart of Haute top and a turquoise blue Petticoat by Malco Modes. We shot these pics against a mid-century modern cabinet filled with cats…. if you look closely there are Holt Howard kitty cats and the blue Norcrest cat too, even a El Gato Gomez cat painting and sculpture in the pics. Keep an eye on Dangerfield Clothing for some more fabulous novelty prints.